It is rumored that Arnolt was touring the Turin Auto Show of 1952 when he spotted two sleek sports cars. These were custom open and closed body coupes built by Bertone of Italy. Because Fiat had recently changed to a unibody construction technique, there were no chassis available to create custom bodied sports cars by the small designers such as Bertone. Bertone's son, Nuccio had located two used MGTD chassis which proved to be just right for a small, agile sports car. 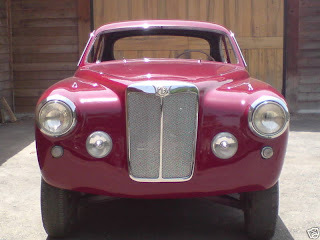 The 1952 Arnolt MG being offered on eBay needs to be reassembled and is located in Israel. According to the seller it's a clean and straight car with "immaculate restored bodywork" and a "100% clean chassis". The seller also states that the bumpers, front and rear screen are missing and some chrome needs attention. The rebuilt engine has a supercharger on it, which was a somewhat common MGTD option in the fifties. Click here to see the eBay listing. In doing some research for this post, I discovered that Wacky Arnolt was also involved in selling a marine engine called the Sea Mite. Click here to see a very well done enthusiast site dedicated to that engine. 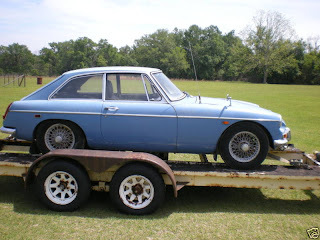 1969 MGB GT - When I was looking for a house back in the early 1990s my only requirements were, besides the basics of indoor plumbing, etc., a 2 car (or more) garage and a fireplace. This car needs complete restoration. Except for some rust in the floor and small bubbles in the dogleg, the seller says it's rust free. It's not a weekend project, but if you start now you'll have a nice car for next year. In recent years I've come to appreciate the MGB GT (See my earlier MGB GT post here). If I had a bigger driveway or a place to store this car (like a barn, maybe? ), I'd be bidding on it.